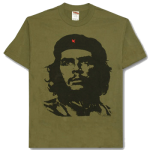 Fashion is an expression of our personality, beliefs and political agenda, so it should come as no surprise the T-shirt has a major role to play in the realm of free speech. To say wearing a T-shirt is an act of free speech may sound extreme, but when you discover what a T-shirt is, you begin to understand just how powerful they really are. This article looks at the T-shirts history, how its social-role has changed and what areas of society it has touched. The T-shirt first emerged in the late 1890s during the Spanish-American war, when the U.S navy started issuing them as thermal layers under uniforms; they provided added protection against the elements whilst away at sea. They were cheap, light and very easy to clean, which are crucial in the military. T-shirts were seen as a functional way to provide warmth, but were also smart enough for the strict military standards, and became part of the naval uniform. T-shirts also found their way into the manual industries, to provide protection for the body during intense work. 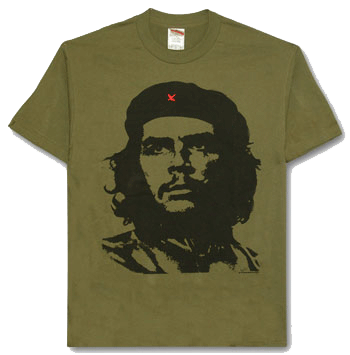 Over time, the T-shirt would move into the general public and be seen as a fashion accessory and eventually into popular culture. This was big jump from its start as a layer of under clothing, as it would have been seen as wrong to wear a piece of private clothing visible to everyone. Before we look at popular culture, one area we should look at is how the T-shirt reveals the wearers body profile. You might have noticed how body builders like to wear them as they complement the body’s muscle size and counters. This is a way for them to show-off their hard work and because they mainly use the T-shirt for this, it has found another niche area to thrive in. The T-shirt made its debut in the film ‘A Street Car Named Desire‘, where Marlon Brando wore a white T-Shirt with denim jeans. After this film came out in 1951, it became popular to wear what the T-shirt as a fashion statement and turn it into a style. Another film we can look at is the 1978 hit, Grease. 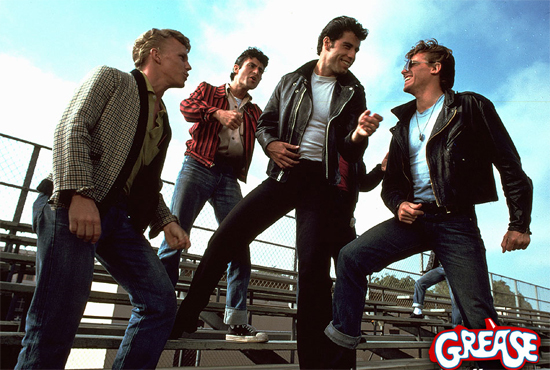 The fashion designer for Grease mixed a white T-shirt with a black leather jacket and dark trousers. This costume has become a fashion icon in film-fashion and again the T-shirt was part of it. Like with the film above, the style was made popular by the film. If you ever want to try this style out fashion, you can get some inspiration from Pinterest. During the 1960s, rock and roll took hold like wildfire, and the T-shirt was used to promote a band’s image and for people to feel like they were part a club. 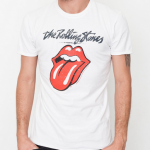 One of the most famous designs is Rollin Stone’s, Tongue and Lips design. This was a huge success in T-shirt branding, and using fashion to advertise your product. These T-shirts are still in production, and you can find a great variation of this design at Blue Banana. 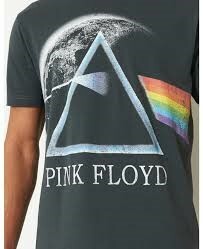 Another successful T-shirt for music was when Pink Floyd put their own design on one. They used their famous Prism album cover as a printed advert and had a huge following and if you want to get your hands on one, you can get them through their own shop here. T-shirts found their way into politics when a cause was being fought, and supporters wanted a way to express their political position. At the beginning of this article we said that T-shirts was a method of speech, and this is why. With a T-shirt, you can print whatever you wish on the front and even though not everyone will agree with you, that is what free speech is all about. When looking at methods of free speech, we should compare attitudes in different countries, and one country we can look at is China. During the early 90s, there was a Chinese artists who started to make printed T-shirts with his own messages or slogans on them, and he had a huge following. This was a radical idea in China, due to their laws of censorship, but it became so popular that it swept across the major cities. The Chinese authorities did not agree with what he was doing and he was accused of causing a major political incident. They also destroyed thousands of his T-shirts in an effort to stop people wearing them. Despite this response from the government, the Chinese people continued to wear them after the ban, as a way of showing support and expressing their right of free speech. We can see that the T-shirt has had a colourful history from a very regimental upbringing in the US Navy, to film, music and politics. We love to express ourselves and the T-shirt is a fantastic platform to do just that. We hope you’ve enjoyed this article and have found a new respect for what used to be a humble T.
You can find the first part of our ‘history of fashion’ series here, which looks at the fascinating history of the hat. Micar computers is a UK based supplier of the original bespoke ERP software solution for the clothing, footwear and textile industries. Visit our profile page to find out more about who we are and what we do. All images used on this blog are property of their respective owners. We would take our own, but they wouldn’t look this good! Ten Wedding Dress Fashions From Different Cultures. The History of Coco Chanel. The History of fashion. Part 4 – High Heels. 10 of the Most Expensive Trainers in the World. Ten of the Best Fashion Instagram Accounts to Follow. A guide to Inventory Management for the apparel industry.